Most security solutions focus on identifying test fraud. Secure exam design and development help you prevent it. 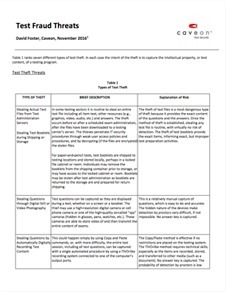 An exam’s design, development process, and even its item types can contribute to its security. Secure test development can help detect test fraud, prevent and deter test cheating and theft, increase the life span of a test, and rapidly reproduce compromised items when a breach is discovered. An exam can be designed to protect itself. We work and partner with organizations who outsource to us the whole range of their exam development needs. Our assessment project managers, as well as our team of psychometric specialists integrate seamlessly into testing programs, allowing our clients to deal with the ebbs and flows of work in a fiscally responsible way. In addition to or in lieu of traditional exam development services, our clients rely on us for specialized support to achieve optimal exam and program health. Our support services are wide-ranging—from exam style guides that emphasize security best practices, to item writing training, performance audits, and more. This range reflects our responsiveness to our client’s ever-changing needs in the dynamic landscape of test security. 1. 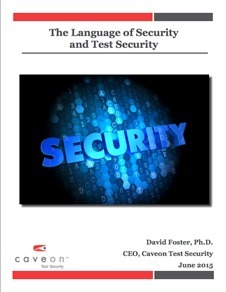 At what stage of the test development lifecycle should security measures be taken? Security measures should be taken at every stage. We recommend a proactive, multifaceted approach that includes security by item and exam design. Additionally, planning your response to breaches before they occur is important and can be accomplished in many ways, including using item pool expansion methods during item development, web patrolling, item analysis and full data forensics, and a written plan of action. For example, web patrolling can let you know when your test materials are being shared. Data forensics can indicate anomalies that need attention. Item analysis can show you where concerns exist and suggest ways to address those concerns. Trojan horse items can provide early indications of cheating. Finally, item pool expansion methods allow you to quickly replace disclosed items with no lag or delay in examinee testing. 2. Which types of exams need security? While it may not seem like a basic certification is high stakes, it is important to consider the implications for the examinee in the event of a passing score or failure. Often, certifications are required for maintaining employment or for advancing in a career. In any situation where the outcome of an exam has a strong effect on employment, career, or life opportunities, the exam is worth careful development and thoughtful security. 3. Most of the time, my team can accommodate our regular workflow, but there are certain times of the year when workflow increases, and we can’t cover all of our needs. What options are available? We can step in at almost any stage of the process to be your second set of hands and second pair of eyes, from project management, to training, exam development, item pool expansion, editing, alignment and performance audits, and more. Let us know what you need. 4. What is the Discrete Option Multiple Choice (DOMC) item type? 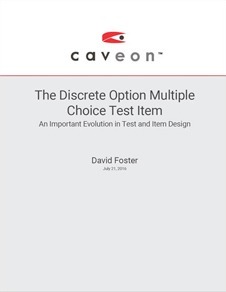 The Discrete Option Multiple Choice (DOMC) item represents a relatively simple but very useful change in the delivery of multiple choice item content on computerized tests. Instead of providing all of the options at one time to the test taker, as is usually done, options are randomly presented one at a time along with YES and NO buttons. For each presented option, the test taker chooses YES or NO as to whether the option is perceived as correct or incorrect, respectively. When the question is answered correctly or incorrectly, additional presentations of options are rendered unnecessary. It prevents or deters many types of test fraud that are damaging every testing program. It promises a more accurate and useful test score, which is a common goal in our industry across all programs. The better the test score, the better are the decisions that are based on that score. It saves a lot of money in test development and test security costs. It effectively addresses many arguments against multiple choice questions. It helps alleviate the unfairness of some testing practices. 5. Web Patrol informed me that my items are disclosed. What should I do next? Our Item Pool Expansion (IPE) service can help you create a breach form by developing item equivalents or item variants. Our team of experts begins by analyzing the disclosed bank for feasibility, then determines the methods that should be used, and finally implements the solution, with the goal of salvaging as much of the original bank as possible, saving clients the time and money of creating all new items. 6. What are key features to look for in an item banking tool? It depends on the specific needs of your program. However, we believe that in a perfect testing world, how we design our items should be dictated by exam need—not constrained by a tool’s current capabilities and the tool owner’s willingness to adapt their tool. Thus, an item banking tool needs to be agile to meet today’s demands in technology and rapid innovation. Next, item banking tools should offer the capability to implement security practices, such as the capability to watermark items or deliver DOMC items. Finally, because of the multi-disciplinary nature of exam development, an item banking tool should never sacrifice user-friendliness. It should be intuitive, and it should make the test development process easier to understand and progress through, not harder.